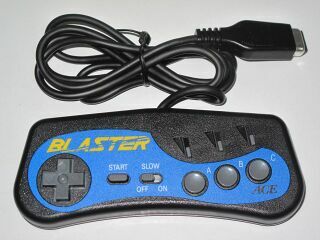 Mega Blaster (メガブラスター) is a third-party controller for the Sega Mega Drive, released by Ace in Japan. It is a simple three button controller with turbo features and came in two forms, a black model and a white model. Inpax brought the controller to North America as the Blaster G, this time styled in red. At present, it is unknown if there are any differences between the Blaster and Blaster G.